The “what to eat and why” plot thickens. So do our artery walls if we’re not careful. According to the CDC (Centers for Disease Control), heart disease is the leading cause of death in the US for both men and women. Back in my exercise physiology days, I had a fascination with heart disease. I wrote my thesis paper on the effects of exercise on coronary collateralization, worked in cardiac rehab, helped develop an outpatient exercise program, watched up-close-and-personal heart procedures, and was convinced I’d make an awesomely fantastic cardiac surgeon (some of the docs back then were alpha males and not the best listeners). If not for that sternal saw thing, I might have given it more thought. What I did learn from that experience, though, is that heart disease is a complex condition and doesn’t always follow a direct line to diagnosis or treatment. Researchers are now questioning some of the basic assumptions about causes, lab biomarkers (blood chemistry), nutrition protocols, drug therapies, and invasive surgeries. Some in the medical community are even rethinking our obsession with low cholesterol and statin drugs. I’ll resist picking up that rope, but suffice to say, there’s no easy answer. Throw in genetics and lifestyle choices and there’s a lot to consider. And now, like there’s not enough to think about regarding heart health and that all-too-common side effect known as sudden death, researchers have discovered those pesky gut bacteria are also playing a role. It appears there’s a type of meat- and egg-loving microbe that produces a substance, which in turn, increases the risk for heart disease. It’s a convoluted pathway, but these microbes convert carnitine (in meat) and choline (in eggs) into a chemical the liver quickly converts to TMAO (trimethylamine N-oxide). TMAO ends up in circulation and is associated with an increased risk for atherosclerosis. That’s not good. For a variety of reasons, I’ve never been much of a meat fan. I’ve always felt we’re better off sticking to a diverse, plant-based diet. If I eat red meat at all, it’s on very rare occasions and in condiment-sized portions. Plants high in beneficial fiber encourage the proliferation of good gut bacteria. Those are the microbes I want on my disease-fighting team, not the carnitine-fueled, gas-belching, TMAO-producing critters. There’s also growing evidence that carnitine and choline supplements promote higher TMAO levels. Beware. The conclusion from the scientific and medical community might be (is) to develop antibiotics to eliminate these microbes. If we wipe out the bacteria that play a part in TMAO production, we solve the problem, right? Hmmm? I wonder what the unintended consequences of that will be? How about we support the magic of our own innate healing power and skip the drugs? Bottom line (in my humble opinion)? Eat more plants and rethink the use of supplements and energy drinks. 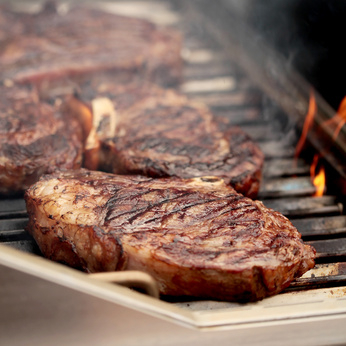 If you’re on a meat-laden Paleo diet, you might want to read the research. For more information about plants, fiber, and gut bacteria, check my last post. If you’re still with me, thank you. I’ll post some recipes that promote good bacteria later this week. No science talk, I promise. Just good food. We’re all in this together. Peace, love, and plant power. Wang Z, et al. “Gut flora metabolism of phosphatidylcholine promotes cardiovascular disease.” Nature 472, 57-63 (April 2011). Willyard, C “Pathology: At the heart of the problem.” Nature 493, S10-S11 (January 2013). This entry was posted on Monday, April 8th, 2013 at 7:28 am	and is filed under Artful Aging, Nutrition Therapy. You can follow any responses to this entry through the RSS 2.0 feed. You can leave a response, or trackback from your own site. Oh duh, skipped over the paragraph you wrote that included carnitine. As someone who sticks to the Paleo diet, I find this really concerning. I have eggs for breakfast every morning and red meat 3 to 4 times a week. I would appreciate your advice on how, if I cut down on the eggs and meat, I don’t end up spending the entire day starving. Thank you for your comment. I also eat eggs (poached). I’m not that concerned about it. If you read the studies, you’ll see that the researchers were surprised, but more research needs to be conducted. It’s just more information to add to the pile. This topic has been all over the NYTimes, the Huffington Post, Science Daily, etc. There are probably people who disagree with the findings. I can’t offer any dietary advice other than the basics, which is stick with whole foods and skip the processed stuff. You could ask your doctor what he/she suggests. Thanks so much for sharing this information. It has been fascinating to come across all of the recent research linking gut microbes to health and illness. I was unaware of the research which you wrote about on TMAO levels and atherosclerosis. I am continually amazed by how much is unknown about common diseases, like heart disease. Thank you also for providing references! It seems like most bloggers do not, and I appreciate being able to read the journal papers myself. I am looking forward to reading more of your posts. I am an M.D. and I have Celiac Disease and a bunch of other food intolerances which I am trying to figure out. You’re SO welcome, and thank you for taking the time to leave a comment. I appreciate it. I’m a research junkie and spend hours pouring over various studies. Then one study leads to another and I’m spiraling all over the place. I think it’s important to cite your sources so people can make their own conclusions. I’m with you on “trying to figure” things out. It’s not easy, but we’re all in this together. Wishing you the best. As usual, excellent food for thought from you Melissa! I have to admit, sometimes I just feel at a loss with food. Thank you, Alisa. I think we’ve made everything more complicated than it should be. In my mind, Michael Pollan was right. Eat food (real food), not too much, mostly plants. We could add “organic” to that, just to be safe. It’s interesting, no one has to tell a grasshopper or an antelope what to eat. They innately know what’s good for them. I think we do too, we’ve just lost our way. Too many choices.